As you should know by now, Wildcat Fitness is most definitely about girl power (I am blessed to work with the most amazing all female PT team) – and as much as we love the boys too, sometimes it’s nice to have something just for ourselves – like these incredible new adidas PureBOOST X trainers – created by women for women. Many running shoes on the market today are simply adaptations of designs made with male athletes in mind and so often don’t offer the support that women need when training – bearing in mind that our weight distribution and sometimes even centre of gravity can be different than that of our male counterparts. So adidas have spent several years researching and testing a trainer that specifically fits the female form. As you’ll see in the photo below, the PureBOOST X has a “floating arch” mid section which supports the base of the foot whilst running, but also a Stretch Web outsole which allows the foot to flex at any point and thus retain its natural motion. Meaning running in these beauties feels supported yet effortless – as running should! Of course specific shoes for womens running have been around for a while, but in the past they have often had quite a “boxy” structured look that puts many females off buying them (myself included!). 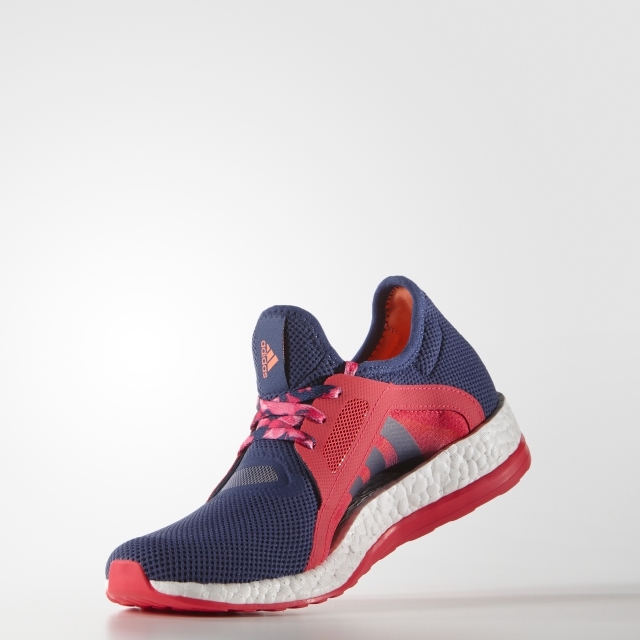 The adidas PureBOOST actually makes the foot look smaller with its supportive wrap-around floating arch, meaning these trainers are as fashionable as they are functional. Personally I can’t wait to give these a go on my next 5k, and to help with those jumps and runs in Body Attack! See you on the running track!